Note this will be very short. So this just happened recently and as I am typing this, I feel like something is outside my house. Not only that, the cameras in the house keep rebooting and the displays keep going to black. So a little backstory, I'm a 20 years old and while I may be a person who that is friendly and prefers the cute pastel theme, I have a huge interest into the paranormal. The irony of it, however, is that if I even see what seems to be a face of a ghost, I'll run screaming. I'm also from a family who believes in ghosts and are religious. Since we believe in the paranormal, we also believe cameras can capture ghosts in action. 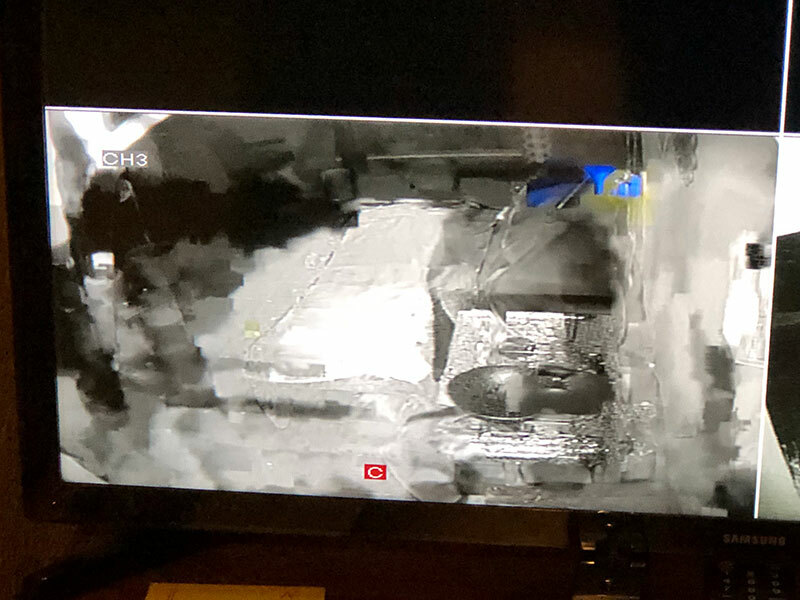 The cameras at my home have captured a few ghosts, or at least the interference they were causing to the camera. So just a while ago, I was just bringing together my work application, my college transcript, and my recommendation letters to apply for a job at the college I was attending. As I finished filling out the application, I noticed something really strange on the camera display. A FACE. A FREAKING FACE. Or at least an implication of a face. The interference on this camera was strong, and I was freaking out. That is not even all. While the face freaked me out, before that, my mom and I also saw a "red dot" that just turned into a "squiggly line". Afterwards, the camera captured a ghost that appeared to be "dancing". I jokingly called the ghost the "Dancing Man" for that reason. But that face, was it the "Dancing Man"'s face? If so, why does it show its face onto the camera like that? The following comments are submitted by users of this site and are not official positions by yourghoststories.com. Please read our guidelines and the previous posts before posting. The author, KankokuMochi, has the following expectation about your feedback: I will read the comments and participate in the discussion. I will soon post the picture of the squiggly red dot and the dancing man, but the picture of the usual background on channel 3 will be up soon. Hello, ladies and gentlemen, I appreciate your advice and suggestions. As soon as finals are over, I will definitely submit of what the patio looked like before the interference. As for the clips of the squiggly red dot and the "Dancing Man", I will send those soon when I get the chance. As for the history of my home, I honestly do not know about the history of it. While I do not know about the history, I do get strange feelings at night outside my home. More stories will come by. Anyways, thank you for listening to this paranoid artist (me) 's story. I second Biblio's request for a regular picture of the area. Though I see what seems to be a person wearing a hooded robe, it's impossible to determine what's on the background, - are those some pumpkins and large flower pots? Perhaps a mop leaning against the wall? It can take a little while for photos to catch up to the story submission; Martin has published it and I've been staring at the image for over five minutes now. You wrote, "I noticed something really strange on the camera display." I honestly cannot tell what it is that I'm looking at. Yes, there's static/interference on screen that makes it difficult to decipher; my problem is that I have no idea what it should look like. I've been trying to determine if this is a screenshot of a garage, a kitchen, or a patio. Would it be a nuisance to ask for a "regular" shot of the image so we can compare it to this heavily-pixellated one? I would not feel comfortable telling you "yes, that's a face all right" nor "you've photographed some shadows that look like a face" without clearer information. As Miandra, I would like to see the video/s and pictures captured by the cameras. Do you live in a house/area known for its of paranormal activity? Do you know if there has been any deaths at/nearby the house? There's not enough information in your narrative as to say if the face and the 'dancing man' are the same entity, it would be a good idea to document the camera's recordings and any factors that could be affecting the equipment's performance. Wow! Pretty scary stuff. Can you forward the clip to Martin? He can attach it to your post. Reply to his email with an attachment. YGS members have helped me heaps. You've come to the right place for help. I look forward to seeing your clip. © The ghost story Interference On Camera is copyrighted to KankokuMochi. Edited by yourghoststories.com.